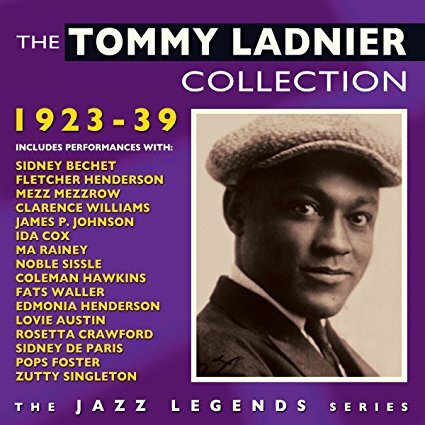 Tommy Ladnier was born in Louisiana 1900 and was an pupil of Bunk Johnson whilst he was still a child often playing alongside Bunk in his band. He moved to Chicago in 1917 and worked with guitarist Gene Sedric in Charlie Creath’s band, whilst in Chicago he worked with players including Jimmy Noone and King Oliver. In the Twenties he worked in the bands of Sam Wooding and Fletcher Henderson in New York and rejoined Sam Wooding to tour Europe, unfortunately during this period he began drinking heavily. He returned to the USA during the post-depression years and opened a tailors shop with Sidney Bechet and it was during that he formed a band with Sidney Bechet, The New Orleans Feetwarmers whtch was probably the highlight of his career. On the break up of his marriage his drinking took a turn for the worse and after long period out of the music business. Thanks to Hugues Panassie he began recording again but he had lost his initial power and died of a heart attack he the early age of thirty nine. This collection is a good overview of his career and covers most of the people he worked with over the years including blues singers Ida Cox and Ma Rainey. On CD One there are eleven tracks by the Lovie Austin and her Blue Serenaders six of these are accompanying blues singers but it is Tommy Ladnier’s powerful cornet which demands the attention of the listener, the recording quality is acceptable considering they were recorded in the early Twenties. The recording quality on the Fletcher Henderson tracks is much clearer and again it’s the cornet of Tommy Ladnier which shines. CD Two brings the recordings into the Thirties and it has two tracks by the Noble Sissle Orchestra and shows it to be a well drilled group and has vocals by the leader. It is the tracks by the New Orleans Feetwarmers which are the highlight of the whole collection with both the clarinet and soprano of Sidney Bechet shining on all tracks ably abetted by Tommy Ladnier particularly on “Sweetie Dear” and “Maple Leaf Rag”. “When You and I Maggie” by Tommy Ladnier’s own ensemble is storming with some powerful Sidney Bechet and Tommy Ladnier. The Mezzrow / Ladnier Quintet were classics of the time and must contain some of Ladnier’s best work on tracks like “Royal Garden Blues” and “Everybody Loves My Baby” and despite what your opinion on Mezz Mezzrow might be he did enter into the spirit of the occasion. If your tastes in jazz are of a more modern persuasion you really ought to listen to some of these tracks to hear where jazz came from.